Phoenix Law Enforcement Association > PLEA News > Phoenix Has a New Police Chief! Phoenix Has a New Police Chief! 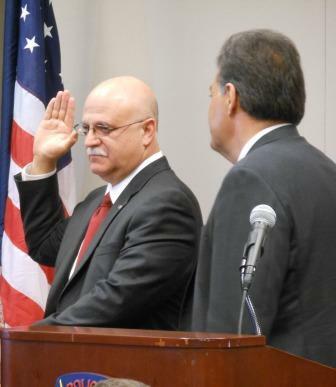 On Monday, May 14, 2012, Daniel V. Garcia, former assistant chief of the Dallas Police Department, was sworn in as the new Phoenix Police Chief in a ceremony at City Hall. PLEA Treasurer/Chief Negotiator Will Buividas represented PLEA at the ceremony. Chief Garcia is a 33 year veteran of the Dallas, Texas Police Department and had been an assistant chief since 2004, managing their Communications, Detention Services, Property, and Legal Services Divisions. He strongly believes in community based policing by keeping lines of communication open between the community and police officers. As our new Police Chief, one of his goals is to partner with all City departments to address crime and maintain a good quality life for Phoenix residents. PLEA looks forward to working with Chief Garcia in solving problems and finding solutions to both the short and long term issues currently facing the Phoenix Police Department and the citizens we serve.